I visited a local meat market recently. (An actual meat market, selling beef and poultry, not a club or a bar.) After my visit, I was disappointed that I couldn’t recommend this place. Not because it’s a bad place. In fact, the butcher and staff were hospitable and answered all of my questions. When I found they get their meat mostly from two places, one located in Philly and another in Maryland, I was thrilled. But after doing some research, I realized that the processing plants are in Philly and Maryland, but the meat is shipped in from other parts of the country. I also didn’t like the butcher’s insistence that grain fed is better because “the animal gets fatter.” This is true, but. . .well, that’s a whole other post. All is not lost, though! Acting on a tip from my friend Johanna (I sound like Lois Lane), I researched Rumbleway Farms in Conowingo, MD instead. What a difference! Rumbleway Farms sells chickens, turkeys, goats, ducks, rabbits and cows, all grass-raised right on the farm. 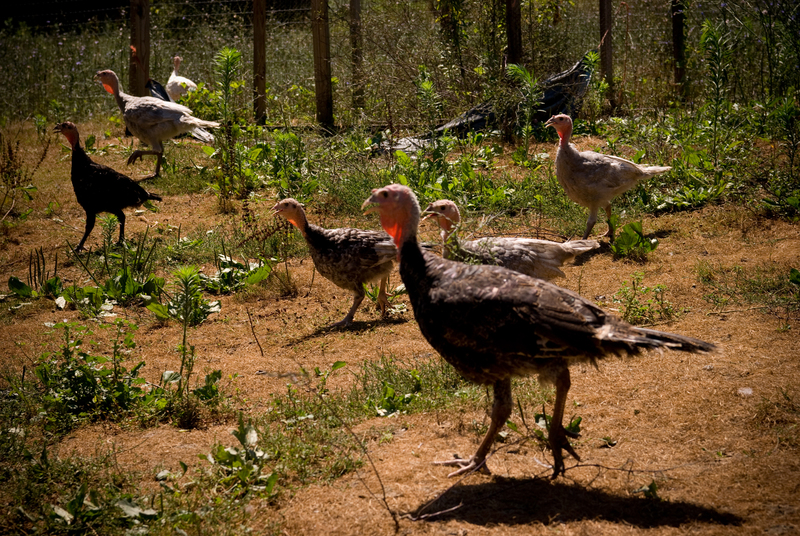 The heritage turkeys roam around and chase bugs, while the happy chickens roam free and peck at grass. It’s like farm heaven, and only 30 miles from my front door! Mark and Robin Way bought the 62-acre property in 1992 and added a processing facility and commercial kitchen along the way. This is a full-service farm with a farm store selling meat as well as jams, mustards, local cheese, natural pet food, and even sauerkraut (a specialty made on site in their icehouse. Yes, they have an icehouse). Call ahead to reserve your fresh meat, Thanksgiving turkey, or order a whole cow if you’re so inclined. As if that’s not enough, they also offer cooking classes and farm dinners. The next dinner is this Saturday. I noticed on their website they are hiring another intern for 2012. If only I was of intern age and didn’t have a full time job! Funny thing is, I’ve become an intern of sorts for John of my favorite farm stand. I was just in his backyard today planting strawberries. He dreams of owning a farm, so maybe he could intern at Rumbleway Farm to learn the ropes! Hmmmm. . . Helpful Tip: If you can’t make it to Conowingo to visit the farm, go to Harvest Market in Hockessin, DE. 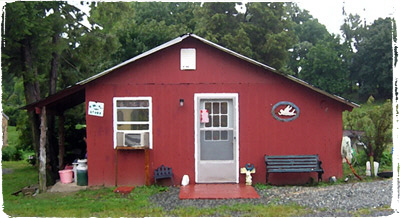 They sell Rumbleway products, as well as many other natural and local items. Haha! 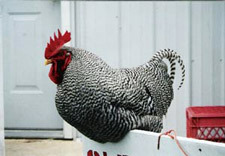 Especially fat roosters like the one in my post. Such a cutie. Rich and I ate a delicious steak from Rumbleway last night! Excellent! Nothing like grass fed to make a great steak. Thanks for stopping by, Anita! Do you know if their beef is 100% grass fed and finish because no where on their site does it state 100% and I find that odd. Hoping that they wouldn’t intentionally mislead people but just curious.